If you were watching the D-backs play the Cardinals on Tuesday night, you saw not only one of the craziest games we’ve seen in this ballpark in some time, but also one of the most amazing individual stat lines you’ll ever see. — Until Chris Snyder’s two-out RBI single in the sixth inning, no team led this game for more than a half inning at a time. The Cards scored two in the first, immediately answered by two for the D-backs in the first. 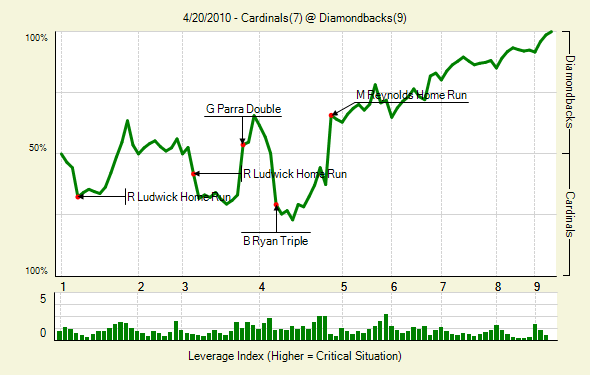 The Cards scored another two in the third, which was immediately trumped by three D-backs runs. The Cards then answered with three in the fourth, which swung the D-backs way again with a Mark Reynolds three-run homer in the bottom of that frame. — It seems hard to believe in a game in which the Cardinals scored seven runs and put 12 runners on base — nine hits, two walks and a strikeout/wild pitch — but the D-backs pitchers closed out the game retiring 16 consecutive batters. Haren intentionally walked Albert Pujols in the fourth inning setting up a Matt Holliday groundout, and no Cardinals reached base after that. — Haren tied the franchise record for hits by a D-backs pitcher with his 4-for-4 effort. They weren’t just random, cheap hits though. 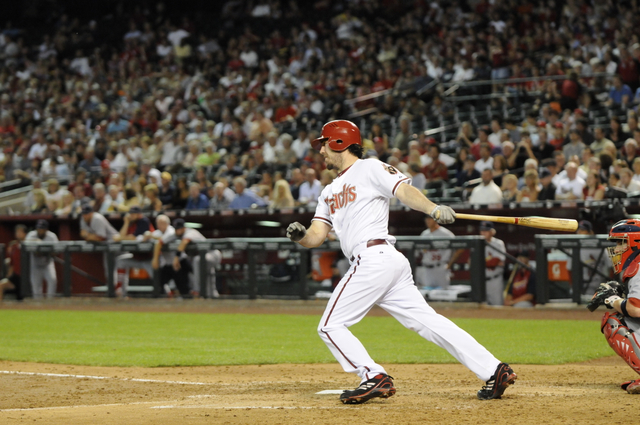 In the third inning, Haren had a two-out RBI single to drive in Gerardo Parra to give the D-backs a lead. In the sixth, A.J. Hinch sent Haren to the plate to hit for himself even though Juan Gutierrez was warming up and the move paid off, as Haren poked a two-out single to left to turn the lineup over. — He turned the lineup over exceptionally well, actually. Three of Haren’s four hits came with two outs, the other came with one out. — Since the year 2000, a pitcher giving up seven but still getting the win has happened only 42 times. The last player to do it strike out as many batters as Haren did (8) last night? He was on that list above — Curt Schilling’s 12 strikeouts in 2001. Dan Haren had himself a game Tuesday you sure don’t see much. He went 4-for-4 at the plate — but gave up seven runs on the mound. So how long has it been since we saw a pitcher get four hits and allow at least seven runs in the same game? More than half a century — since Mickey McDermott did it for the Red Sox, in a 14-10 win over the Yankees, on May 25, 1953. If nothing else, last night’s crazy game was evidence that it’s always a great night out at the ballpark — you never know what you might see. Dan Haren met with the media Friday night in advance of his Opening Day start against the Padres on Monday at 2:10 p.m. at Chase Field. Q: Can you give us your thoughts on Monday, Opening Day, and being on the mound? A: It’s going to be very exciting. I’ve been looking forward to this since A.J. told me I’d be starting the first game of the year. A lot leading up to this, all of the workouts in the offseason, Spring Training and getting up early for a month and a half straight. To finally get things going will be exciting. Q: How do you feel about this team now that Spring Training is over? A: I feel the same way I felt coming into the spring. Our lineup is improved, bullpen is improved and I’m just looking forward to just getting out there and competing. I’m sure we’ll score more runs, play better defense and that was obviously a big key for us this spring. I’m just looking forward and I think everybody is looking forward to getting things going. Q: (Brandon) Webb said he thinks you may have some jitters even though you’ve done this before. Do you still get them? A: I get theme very time out. If you don’t get the jitters, something is wrong. There is a lot leading up to the game. I’m sure the night before it will be tough sleeping and I’ll wake up early with a long drive to the field. It will be nice. Once I get out there and throw a few pitches, I’m fine. Q: Can you talk a little bit about the Padres? A: They always give me fits. They always seem to be close games, always, especially at their ballpark and its low scoring. Adrian Gonzalez is obviously one of the best players in the league and it kind of all starts and ends with him. You try not to let him do too much damage and keep the guys off base ahead of him. Q: Do you set goals yourself for a season? A: Well, the No. 1 goal for me is to be healthy. If I make 33 or 34 starts, the numbers will take care of themselves. I’ve been blessed with health the last few years and hopefully again this year. Q: Is there something special about not only Opening Day, but Opening Day at home? A: Yeah, my first year here, I pitched the home opener, which was nice. I remember it was against the Dodgers. This will be an exciting environment here. It’s going to be fun. It’s such a change. You go from pitching in Tucson or Surprise and all these fields, and it’s such a mellow atmosphere. Then you get out here and it’s electric. I’m looking forward to it. Q: Does it feel different when there’s 35-plus thousand in the house, and you get that big Opening Day crowd? A: Yeah, it’s easy to get loose. The adrenaline starts pumping the second you get on the dirt and start my warm-up tosses. Its easy to get loose, easy to get going and its just a matter of controlling your emotions.